No two ways about it: Ikta just spanked a foolish child. The older Torway brother got beat something bad. These latest two episodes covered ground fast: Ikta and friends get to school, participate in a mock battle, then show everyone up save the princess from some diabolical revenge scheme. I’ll try not to act like I’m too impressed that this whole story played back into the events that lead to our five heroes joining the military in the first place, but I totally was. I’m always a bit worried when anime characters go to school; all too often, no matter what they might have been doing beforehand, they get stuck in trope-riddled, silly comedy hell. 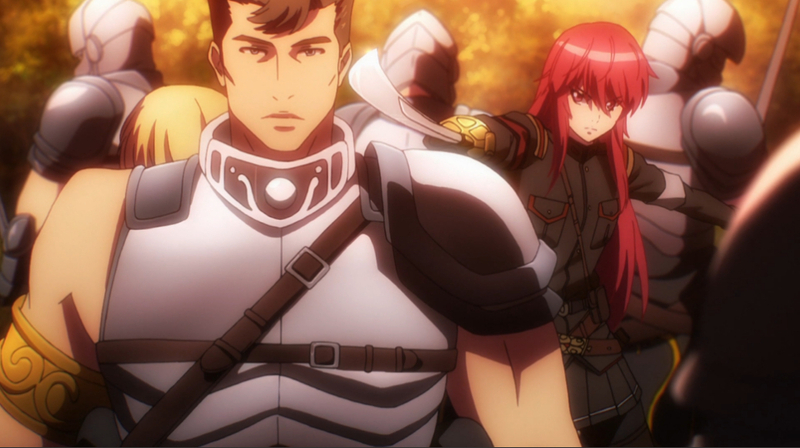 Not that I have a problem with school comedies, but that isn’t what I want from Alderamin. Ikta quickly laid those fears to rest in these past two episodes. 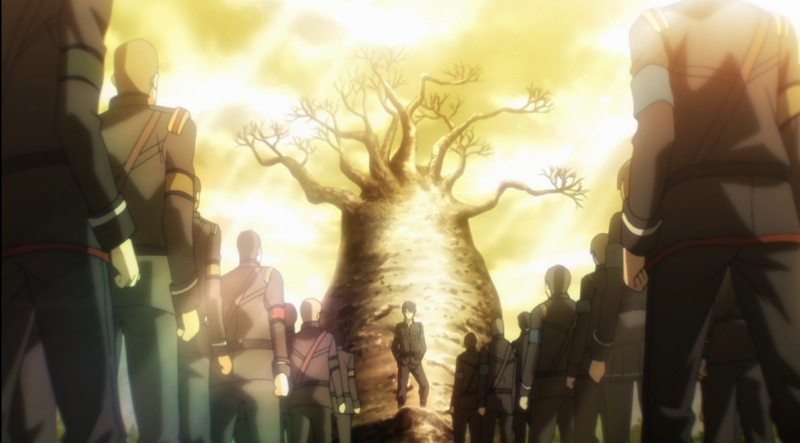 Even if we are stuck in school– sort of– this isn’t the usual oh-so-plucky anime school of my nightmares. Yatori’s smug look says more about Ikta’s investment in tactical knowledge than he is likely to ever say for himself. 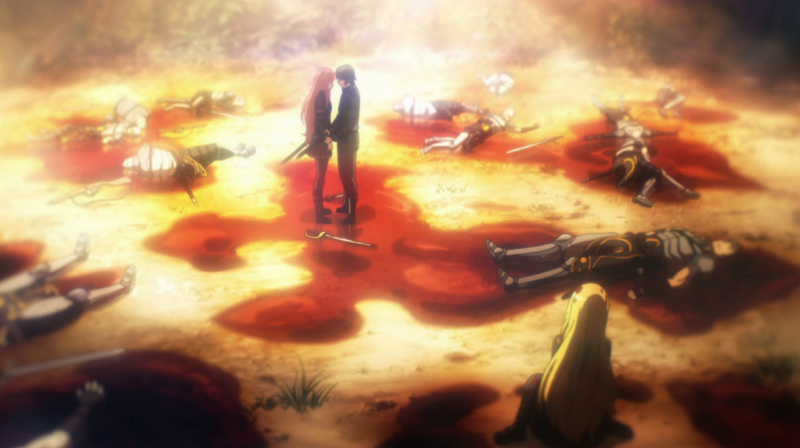 Overall, it’s impressive just how fast these two episodes managed to progress without feeling rushed. 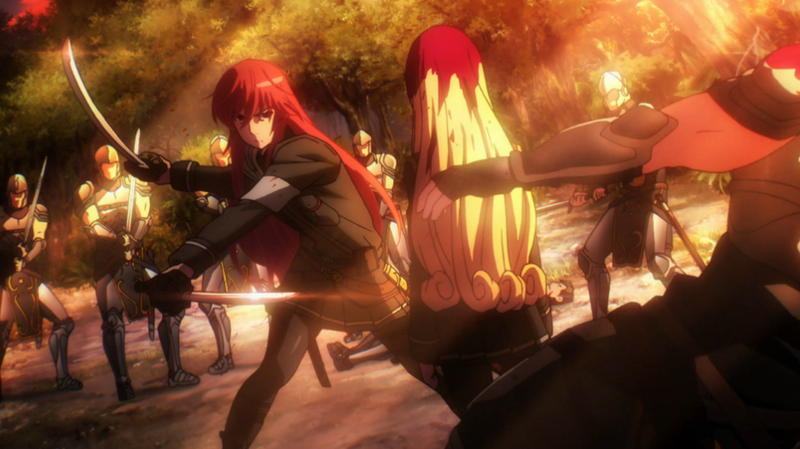 One dynamic I’m loving about Alderamin is how the world building is painted by Ikta’s relationship with Yatori; Ikta does something and Yatori follows up. 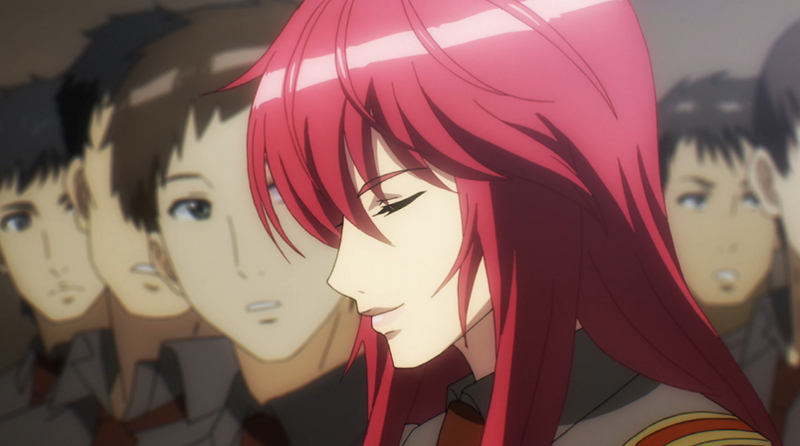 Ikta makes a joke about the Alderamin scriptures banning hot guys from his presence, and Yatori calmly reminds Ikta that he could get hauled off for blasphemy. Ikta might enjoy showing off a bit too much for his own good. Ikta and Yatori are both interesting in that they seem to think of themselves as above their political situation…not necessarily in an obnoxious, arrogant way, but more of a looking-into-the-future -with-a-plan kind of way. It’s something that conflicts with Ikta’s lazy persona. Taken at face value, laziness isn’t exactly the most admirable quality, but no matter what Ikta says, I can’t see him as entirely unmotivated. He’s clearly willing to put in the effort when it’s needed and when it will accomplish his goals. Put another way, he is willing to earn his laziness. In case you missed what this episode was doing, this is an example of what happens when you are not lazy. Really, the most interesting thing about the show (besides the Ikta/Yatori dynamic in general) is Ikta’s spin on laziness as a thing to be valued. I’m reminded of the T-shirt I commonly see at anime conventions: “I’m not lazy, I’m energy efficient.” It’s hilariously out of place as a military slogan, but then I guess that’s the point. I feel like I should hate Ikta, but I don’t. A big part of what’s selling me on Ikta’s character is how sarcastic he is. When he gives his ridiculous speech on laziness he is serious to a point, but he’s also putting on a show for his own amusement. He never wastes an opportunity to get a hit in on the popular ideology of his nation. In fact, most of what we know about the setting has been painted by his sarcasm. Yatori and Ikta are strong, but they aren’t the only ones who are. So far we’ve seen Itka put up a strong argument for science and logical thinking. It feels a bit cheesy when Ikta talks about science all the time, but in a world where science has little value, his strong feelings make sense. After all, there’s nothing cheesy about losing loved ones to a war fought with outdated ways of thinking. Or that lead to a bloodbath like this. If there’s one moral point Ikta deserves credit for it’s that he always speaks his mind. I feel like he’s usually putting on an act, but that act is a genuine reflection of what he wants to say. I came away feeling like he may have seriously considered joining the rebels if they had tried to include him in their plot. 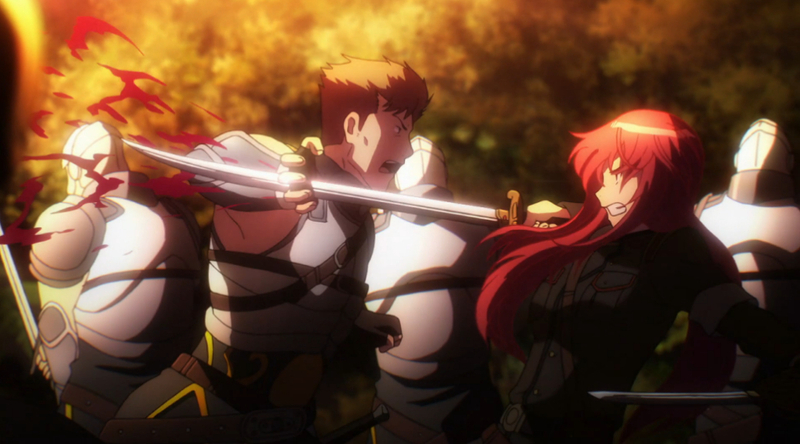 The fight at the end of episode four deserves some special attention. Yatori’s adrenaline high was scary. 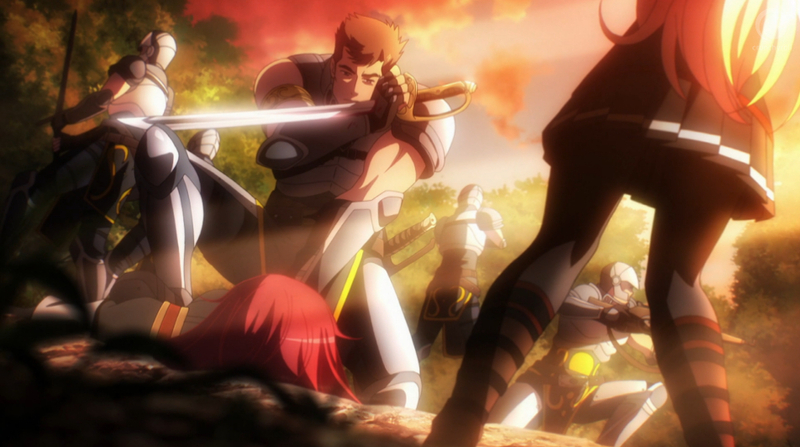 In general I find the combat in Alderamin inspires a level of terror unfamiliar to most anime. Part of that terror is inspired by how coldly enemies are treated when push comes to shove; part of it from how neutral Ikta is about the morality of it all. 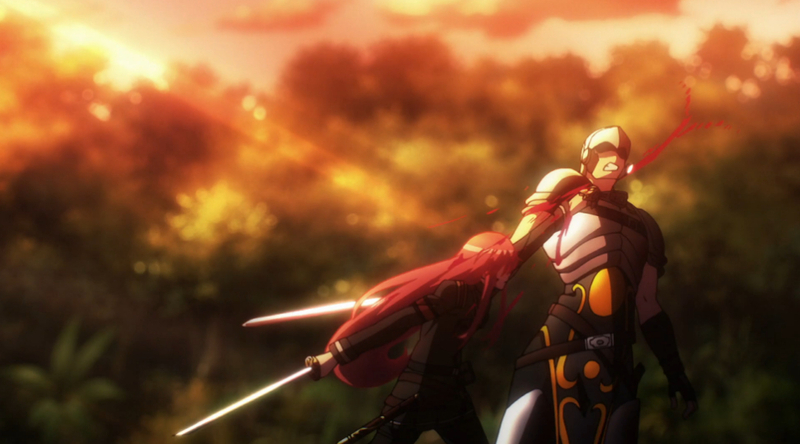 I wonder if Yatori would point her blade at Ikta so easily if had joined these rebels. As for the fight itself I was impressed by how it played out; it felt real. Sure, it was an incredibly one-sided massacre once Yatori freed herself, but looking at the encounter as a whole? It had me on the edge of my seat. I wonder if this is the first time Yatori has come so close to getting herself killed? I want to see the story of how Ikta and Yatori grew close in the first place. I have a hard time imagining either of them had a kind childhood; Yatori kills without hesitation and Ikta doesn’t seem bothered by that in the least. They have the type of relationship that you only really see in people who have overcome huge obstacles together. Yatori’s post-bloodbath scene did a number on me: The heavy breathing, the sound of Yatori’s own voice amplified by her adrenaline high, the way she couldn’t release her grip on the swords…it had a mesmerizing weight to it. I had to watch it a few times to fully process it. I’m not sure where the story will go from here, but as long as it continues to focus on Ikta and Yatori’s relationship I’ve little doubt it will keep my attention. [That’s all well and good, but I want more of the mini Care Bears.-Karen] For now, I think Yatori needs some proper chill time in a hammock– and maybe I do too! That closing scene was downright exhausting. I find myself just a bit overwhelmed by how tragic this is. 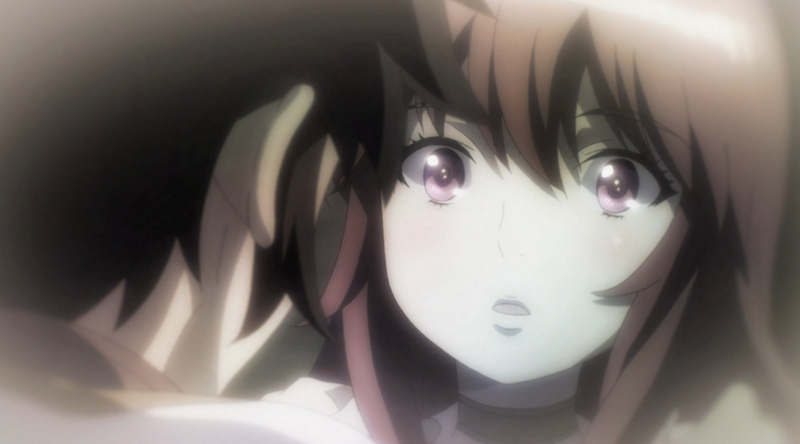 Fun fact: Alderamin is the name of a star. According to Wikipedia the Arabic meaning is “the right arm”. That seems fitting after Ikta tells Yatori that he is her left hand.